Do you have a business which utilizes a large building or work shop? Have a building with several rooms that need heating? Then you are someone who is probably in the market for industrial boilers or furnaces. A boiler can usually accomplish many heating tasks for you, but surprisingly the process normally doesn’t involve actually boiling something. The unit will contain a liquid (usually water) which is heated up in the reservoir for hot water use, sanitation, cooking, and central air too. If you want to be able to consistently heat up your business without any cold patches, then it is time to start looking for an energy efficient boiler certified by Energy Star, as well as a talented team of technicians who can install and service the system for you. Traditional boilers in the past used the burning of fuels to power them, but nowadays there are many easier to use electric models of boiler available on the market. Don’t trust the responsibility of caring for your industrial boiler or air conditioner up to the work of un-trained individuals. Not only could this damage the quality of your unit, it could put that person in a dangerous situation. 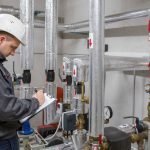 Boilers use hot temperatures to heat liquid, and when dealing with the parts in order to make repairs, you could be dealing with scorching hot valves or other metal pieces. If you want to get the job done well the first time around, you can count on Room Cooling Air Purifier & HVAC for the latest developments, and always free quotes upon request.